Hainanese chicken is a Singaporean dish that is also popular in the Philippines because of its delicate savoury flavour. The idea of rice steamed in the flavourful cooking broth of the chicken itself also makes your average Asian postgrad student easily hungry. 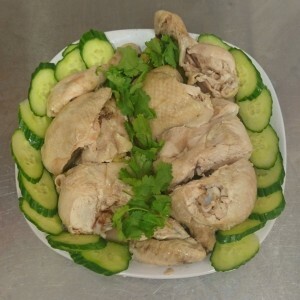 Recipes for Hainanese chicken usually involve multi-step and alternating hot-and-cold “shocking” baths for the chicken to get its silky smooth texture just like the ones sold at the hawker centres. On a Friday afternoon, with my courses done for the day, I realised that I had a lot of time on my hands. Meanwhile, the Crock Pot™ slow cooker that my sister sent over was waiting to be put through its paces. I tried searching for Hainanese chicken recipes designed specifically for a slow cooker, but couldn’t find any. So I decided to adapt one from the recipe Singaporean Hainanese Chicken Rice by Pat on Allrecipes.com.au. I kitchen-tested it in a modest, student accommodation self-catering kitchen at Edinburgh, Scotland, in the UK. Looking at the equipment, timetable, and ingredients, I’m pretty confident this can be done pretty much elsewhere. Enjoy! Carefully trim off excess fat from the whole chicken, then pat dry. Rub salt all around it and in the cavity. Insert four crushed garlic cloves and four ginger slices into the chicken’s cavity. Stuff the rest of the cavity with the whole green part of spring onions, aligned lengthwise with the bird’s body. 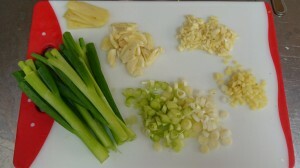 Ensure that no spring onions are jutting out of the cavity. Set the chicken aside. In a non-stick frying pan, combine and then heat the vegetable and sesame oils. Stir-fry the minced garlic (do not brown), minced ginger, and white part of the spring onions until the spring onions are translucent. Add the rice to the frying pan. 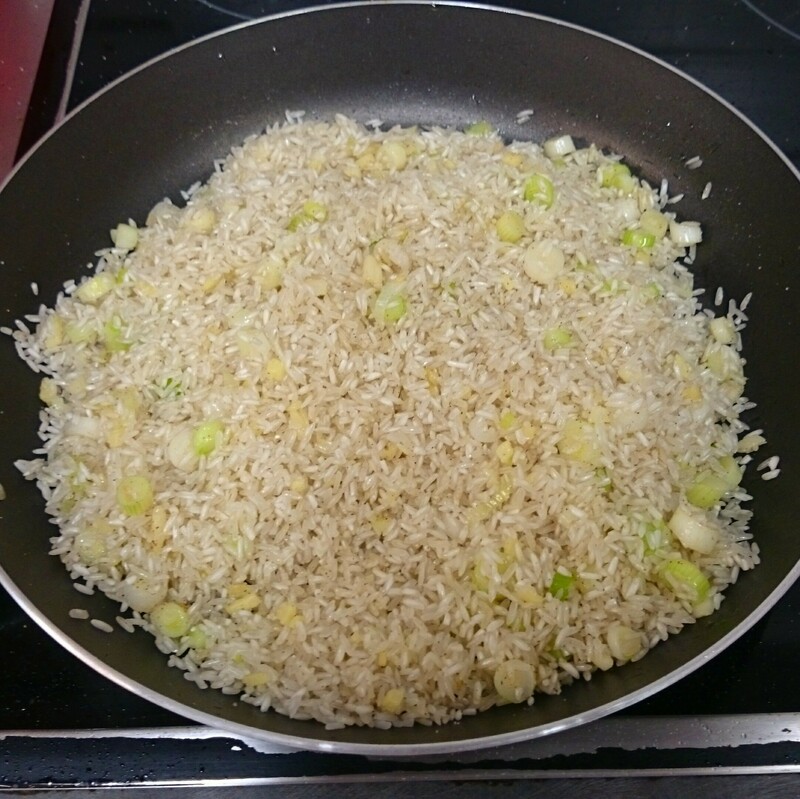 Stir carefully to coat the rice with the oil mixture. Add salt and white pepper to taste. Toast the rice for 3-5 minutes over medium heat. Transfer the toasted rice into the stoneware cooking pot, layering it evenly on the pot’s bottom. Add just enough warm water to a level approximately 3-4 cm (around 1.25 in) above the rice. Place the whole chicken breast side down onto the rice and water layers in the middle of the pot. Cover the pot and switch on the slow cooker to the HIGH setting. Allow cooking to proceed undisturbed (do NOT open the lid) for 2.5 hours. Switch the slow cooker to WARM mode after cooking time has elapsed. 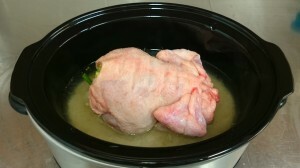 Carefully lift the whole chicken out of the pot, making sure that it is not severed or mashed. Mix the cooked rice in the pot, then cover it again until ready to serve. (Optional) In a large mixing bowl, “shock” the chicken by covering it with ice water. Discard the water after 5-10 seconds. Using a cleaver, chop the chicken first lengthwise into half, then crosswise into 1-2 inch (2.5-5 cm) thick slices. Garnish with cucumber slices, cilantro, and tomato slices (optional). Serve with the cooked rice in the pot, as well as hoisin sauce, chili oil, and minced ginger in peanut oil on the side (use separate dipping containers). I think the next step is to tinker with a sous vide machine.